Basic biographical data as of "Star Trek Generations" (2293). James T. Kirk was the commander of the Starship Enterprise NCC-1701 during its five-year mission of exploration in 2264-2269 (TOS: "Where No Man Has Gone Before"). His Starfleet serial number was SC 937-0176 CEC (TOS: "Court Martial"). Kirk was born in 2233 (TOS: "The Deadly Years") in Iowa on planet Earth ("Star Trek IV: The Voyage Home"). In 2246, Kirk - at the age of 13 - was one of nine surviving eyewitnesses to the massacre of some 4,000 colonists at planet Tarsus IV by Kodos the Executioner (TOS: "The Conscience of the King"). James Kirk lost his older brother, George Samuel Kirk (whom only James called Sam) and sister-in-law, Aurelan Kirk, on planet Deneva due to the invasion of the Denevan neural parasites in 2267. 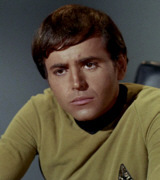 Kirk's nephew, Peter Kirk, survived (TOS: "Operation - Annihilate!"). Sam Kirk had two other sons who were not on Deneva at the time of the tragedy (TOS: "What are Little Girls Made of?"). During his academy days, Kirk was tormented by an upperclassmen named Finnegan, who frequently chose Kirk as a target for practical jokes. Kirk found a measure of satisfaction years later, in 2267, when he had the chance to wallop a replica of Finnegan created on the amusement park planet in the Omicron Delta region (TOS: "Shore Leave"). Kirk served as an instructor at the academy, and Gary Mitchell was one of his students. The two were good friends since their teenage days. Once Mitchell took a poisonous dart on Dimorus meant for Kirk, saving Kirk's life. 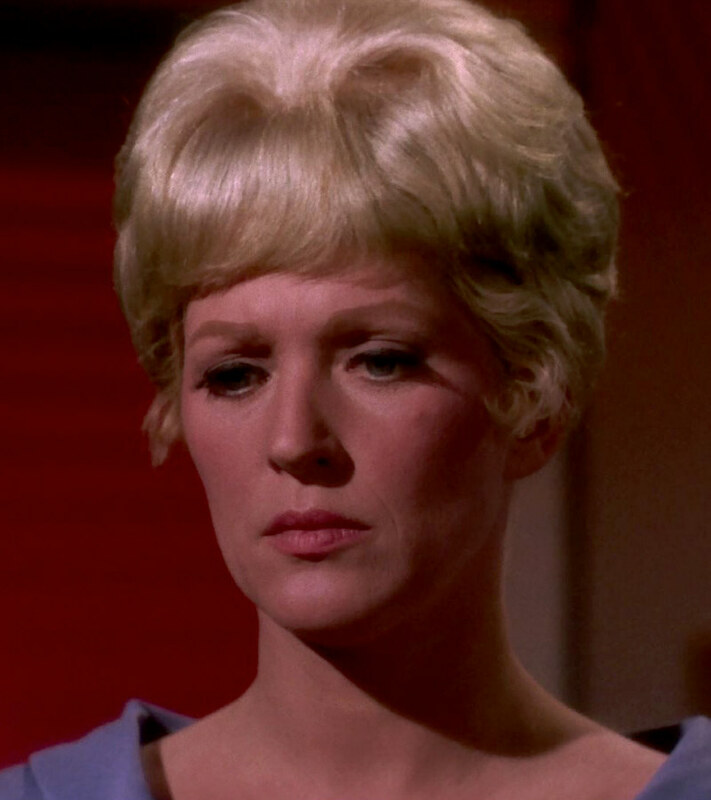 Mitchell set up Kirk with a "little blonde lab technician" whom Kirk almost married* (TOS: "Where No Man Has Gone Before"). Another of Kirk's friends from his Academy days was Ben Finney, who named his daughter, Jamie, after Kirk. A rift developed between Finney and Kirk around 2250 when the two were serving together on the USS Republic. 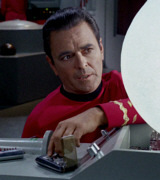 Kirk logged a mistake that Finney had made, and Finney blamed Kirk for his subsequent failure to earn command of a starship (TOS: "Court Martial"). One of Kirk's heroes at the Academy was the legendary captain Garth of Izar, whose exploits are required reading. Years later Kirk helped save his hero when Garth had become criminally insane and was being held treated at the Elba II penal colony (TOS: "Whom Gods Destroy"). Another of Kirk's personal heroes was Abraham Lincoln, 16th president of the United States of America on Earth (TOS: "The Savage Curtain"). 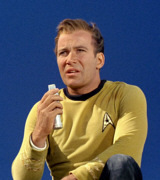 At the Academy, James Kirk earned something of a reputation for himself as having been the only cadet ever to have beaten the "no-win" Kobayashi Maru scenario. He did it by secretly reprogramming the simulation computer to make it possible to win, earning a commendation for original thinking in the process ("Star Trek II: The Wrath Of Khan"). Kirk served aboard the USS Farragut as a young officer (TOS: "Obsession"). One of his first missions as a young lieutenant was to command a survey mission to Tyree's planet in 2254 (TOS: "A Private Little War"). While serving aboard the Farragut in 2257, Lieutenant Kirk blamed himself for the deaths of 200 Farragut personnel, including Captain Garrovick, by the dilithium cloud creature at planet Tycho IV. 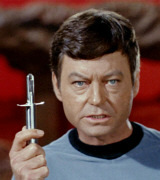 Kirk felt he could have acted faster in firing on the creature, but learned years later that nothing could have prevented the deaths (TOS: "Obsession"). Sometime in the past, Kirk almost died from Vegan choriomeningitis (TOS: "The Mark of Gideon"). Kirk's greatest renown came from his command of a historic five-year mission of the original Starship Enterprise from 2264 to 2269 that made him a legend in space exploration ("Star Trek Generations"). By 2267, Kirk had earned an impressive list of commendations from Starfleet, including the Palm Leaf of Axanar Peace Mission, the Grankite Order of Tactics (Class of Excellence) and the Preantares Ribbon of Commendation (Classes First and Second). Kirk's awards for valor included the Medal of Honor, the Silver Palm with Cluster, the Starfleet Citation for Conspicuous Gallantry, and the Kragite Order of Heroism (TOS: "Court Martial"). In 2267, Kirk became the first starship captain ever to stand trial when he was accused of causing the death of Ben Finney. 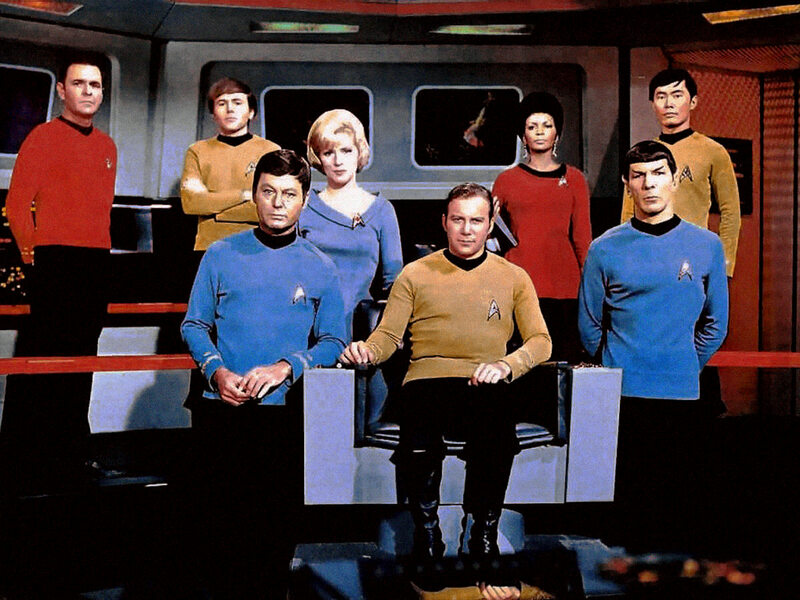 Kirk's trial, held at Starbase 11, proved Kirk innocent of wrongdoing, and he was exonerated (TOS: "Court Martial"). During that original five-year mission, Kirk recorded a tape of last orders to be played by Commander Spock and Chief Medical Officer McCoy upon his death. While trapped in a spatial interphase near Tholian space, Kirk vanished with the USS Defiant and was declared dead. His last orders conveyed the hope that his two friends would work together despite their differences (TOS: "The Tholian Web"). 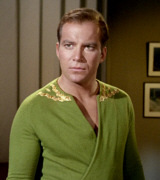 Kirk was once split into two personalities by a transporter malfunction (TOS: "The Enemy Within"). Several of Kirk's voyages involved travel through time. According to the Federation Department of Temporal Investigations, Kirk, who sometimes ignored regulations when he felt it was for the greater good, amassed 17 separate temporal violations during his career, more than any other person on file (DS9: "Trials and Tribble-ations"). Kirk's living quarters aboard the original Enterprise were on Deck 5 (TOS: "Journey To Babel"). It was during this five-year mission that Kirk's friendships with officers Spock and McCoy developed, friendships that would last for the rest of their lives. Kirk went back in time six times that we know of: "The Naked Time, "Assignment: Earth", "Tomorrow Is Yesterday", "City on the Edge of Forever", "All Our Yesterdays" and "Star Trek IV: The Voyage Home". He also went forward in time in Star Trek: Generations. Kirk was notably unsuccessful in maintaining a long-term relationship with any woman. Although he was involved with many different women during his life, his intense passion for his ship and his career always seemed to interfere. 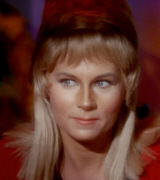 A few years prior to his command of the first Enterprise, Kirk became involved with Dr. Carol Marcus. The two had a child, David Marcus, but Kirk and Carol did not remain together, because their respective careers took them in separate directions. 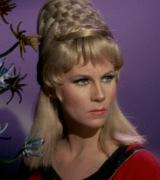 Other significant romances in Kirk's life included Ruth, with whom he was involved when he attended Starfleet Academy (TOS: "Shore Leave"); Janice Lester, with whom he spent a year, also during his academy days (TOS: "Turnabout Intruder"); Janet Wallace, a scientist who later saved his life (TOS: "The Deadly Years"); Areel Shaw, who, ironically, years later prosecuted Kirk in the case of Ben Finney's apparent death (TOS: "Court Martial"); and Miramanee, a woman whom Kirk married in 2268 when he suffered from amnesia aboard a landing party. 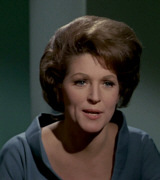 Miramanee became pregnant with Kirk's child, but both mother and unborn child were killed in a love power struggle (TOS: "The Paradise Syndrome"). Kirk fell in love with Antonia after his first retirement from Starfleet, and for the rest of his life regretted not having proposed to her ("Star Trek Generations"). 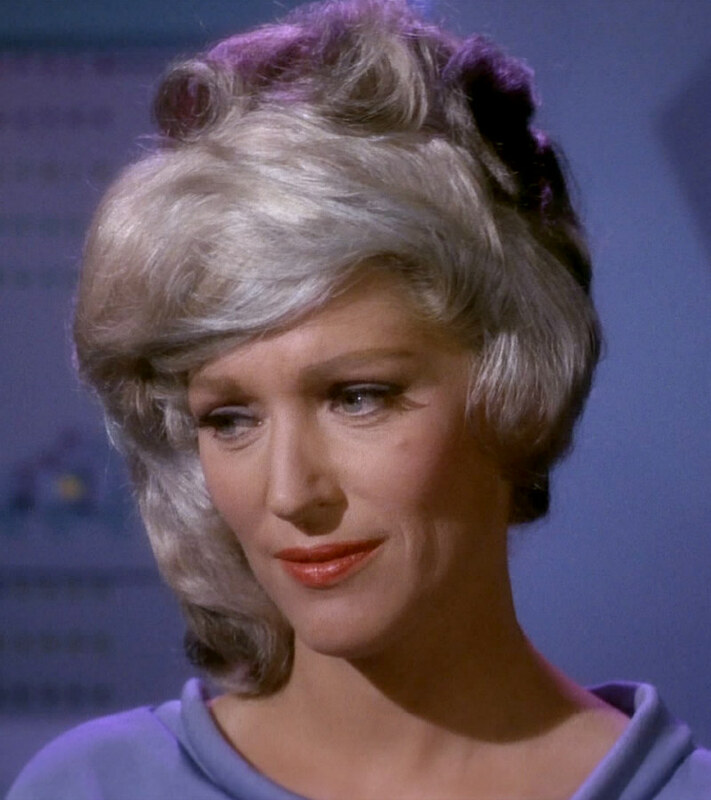 Perhaps Kirk's most tragic romantic involvement was with American social worker Edith Keeler, whom Kirk met in Earth's past when he traveled into the 1930's through the Guardian of Forever. Keeler was a focal point in time, and Kirk was forced to allow her death in order to prevent a terrible change in the flow of history (TOS: "The City on the Edge of Forever"). Kirk was not involved with the bringing up of his son, David Marcus, at the request of the boy's mother, Carol Marcus. Kirk had no contact with his son until 2285, when Carol and David were both working on Project Genesis, and Kirk helped rescue the two from Khan's vengeance. 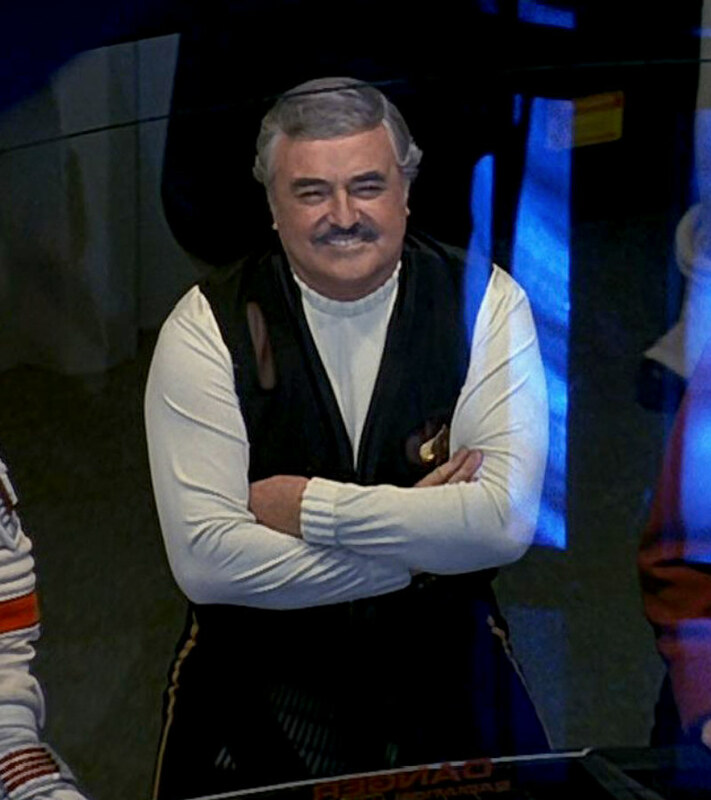 Later, Kirk and his son were able to achieve a degree of rapprochement ("Star Trek II: The Wrath of Khan"). Tragically, David was murdered shortly thereafter on the Genesis Planet, by a Klingon officer who sought to steal the secret of Genesis ("Star Trek III: The Search for Spock"). Kirk returned to Starfleet in 2284 ("Star Trek Generations") and became a staff instructor with the rank of admiral at Starfleet Academy. Kirk was dissatisfied with ground assignment, and returned to active duty in 2285 when Khan Noonien Singh hijacked the Starship Reliant and stole the Genesis Device. Kirk's close friend, Spock, was killed in that incident ("Star Trek II: The Wrath Of Khan"). Upon learning that Spock's katra had survived, Kirk hijacked the Enterprise to the Genesis Planet to return Spock's body to Vulcan, where Spock was brought back to life when body and katra were reunited. Kirk ordered the Enterprise the Enterprise destroyed in the incident to prevent its capture by Klingons ("Star Trek III: The Search For Spock"). Kirk was charged with nine violations of Starfleet regulations in connection with the revival of Spock in 2285. All but one charge was later dropped, and Kirk was found guilty of the one remaining charge, that of disobeying a superior officer. The Federation Council was nonetheless so grateful for Kirk's role in saving Earth from the devastating effects of an alien probe that it granted Kirk the captaincy of the second Starship Enterprise ("Star Trek IV: The Voyage Home"). Kirk was an intensely driven individual who loved the outdoors. A personal challenge that nearly cost him his life was free-climbing the sheer El Capitan mountain face in Yosemite National Park on Earth ("Star Trek V: The Final Frontier"). He was an accomplished equestrian, and kept a horse at a mountain cabin that he owned during his first retirement. Another companion at his mountain cabin was Butler, his Great Dane. He sold the cabin some time after his return to Starfleet ("Star Trek Generations"). Kirk carried the bitterness for his son's murder for years, and opposed the peace initiative of Klingon Chancellor Gorkon in 2293. He especially resented the fact that he was chosen as the Federation's olive branch and assigned duty of escorting Gorkon to Earth. During that mission, Kirk (along with McCoy) was arrested and wrongly convicted for the murder of Gorkon by Federation and Klingon forces conspiring to block Gorkon's initiatives. 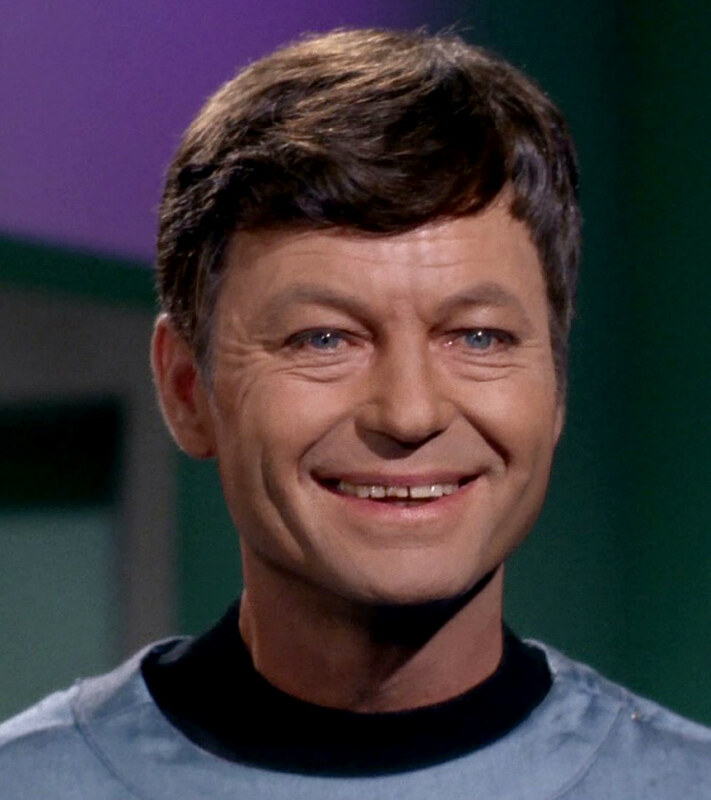 Kirk nevertheless played a pivotal role in saving the historic Khitomer peace conference from further attacks. Kirk retired from Starfleet a second time about three months after the Khitomer Accords were signed ("Star Trek VI: The Undiscovered Country"). Shortly after his second retirement, Kirk was an honored guest at the launch of the Excelsior-class Starship Enterprise-B in 2293. Kirk was believed killed on that ship's maiden voyage, although it was later learned that he had actually disappeared into a temporal anomaly called the nexus. He remained in the Nexus until 2371, when he emerged to save the inhabitants of the Veridian system. Kirk, working with fellow Enterprise Captain Jean-Luc Picard, was successful in saving the Veridians, but the heroic effort cost Kirk his life at the hand of the deranged scientist, Tolian Soran. James T. Kirk is buried on a mountain top on planet Veridian III. He went boldly where no one had gone before ("Star Trek Generations"). * The "blonde lab technician" may be Carol Marcus, although this is mere speculation. ** The significant time gap between "Star Trek: The Motion Picture" and "Star Trek II: The Wrath of Khan" suggests the possibility that Kirk commanded another five-year mission of the Enterprise following the events in the first Star Trek movie, although this is pure conjecture. If Kirk and the Enterprise did embark on another five-year mission in 2271, they probably returned in 2276. "Star Trek Generations" could be interpreted to suggest that Kirk's first retirement was some time between 2276 and 2282, when he first met Antonia. On the other hand, the 2271 date for "Star Trek: The Motion Picture" is itself somewhat conjectural in that it is based purely on the 18-month refit time for the Enterprise. It is not impossible that Kirk and the Enterprise had other assignments after the television series, but before the major refit of the ship. Such assignments would push back the date for the first Star Trek film, but would not significantly invalidate the timeline. Science officer aboard the Starship Enterprise NCC-1701 under the command of Captain James T. Kirk. Born 2230 on planet Vulcan. His mother, Amanda Grayson, was a school teacher from Earth and his father, Sarek, was a diplomat from Vulcan (TOS: "This Side of Paradise", "Journey to Babel"). As a result, he was torn between two worlds, the stern discipline of Vulcan logic and the emotionalism of his human side. The struggle to reconcile his two halves would torment him for much of his life (TOS: "The Naked Time"). Spock's Starfleet service number was S179-276 SP. 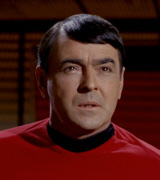 As of 2267, he had earned the Vulcanian Scientific Legion of Honour, had been twice decorated by Starfleet Command (TOS: "Court Martial"), and held an A7 computer expert classification (TOS: "The Ultimate Computer"). His blood type was T-negative (TOS: "Journey to Babel"). When he was five years old, Spock came home upset because Vulcan boys had tormented him, saying he wasn't really Vulcan. As a child, Spock had a pet sehlat, sort of a live Vulcan teddy bear (TOS: "Journey to Babel"). 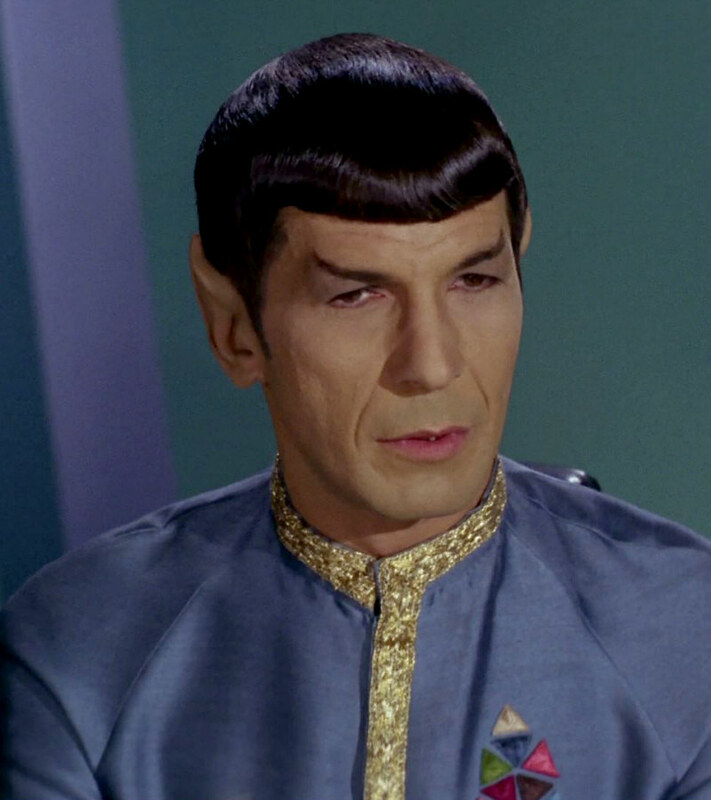 Spock was raised with an older brother, Sybok, until Sybok was ostracized from Vulcan society because he rejected the Vulcan dogma of pure logic. Gene Roddenberry considered the Sybok story to be apocryphal. Spock himself endured considerable antihuman prejudice on the part of many Vulcans, and experience that may have later made it easier for Spock to find a home in the interstellar community of Starfleet (Star Trek V: The Final Frontier). At age seven, Spock was telepathically bonded with a young Vulcan girl named T'Pring. Less than a marriage, but more than a betrothal, the telepathic touch would draw the two together when the time was right after both came of age (TOS: "Amok Time"). Spock experienced Pon farr, the powerful mating drive, in 2267, and he was compelled to return to Vulcan to claim T'Pring as his wife. 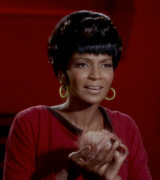 T'Pring spurned Spock in favor of Stonn, freeing Spock (TOS: "Amok Time"). 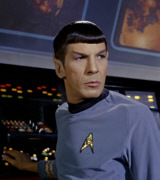 Spock's father, Sarek, had hoped his would attend the Vulcan Science Academy, and was bitterly disappointed when Spock instead chose to join Starfleet. Spock and his father had not spoken as father and son for 18 years when a medial emergency drew them together (TOS: "Journey to Babel"). Under the command of James Kirk, Spock suffered infection by parasites on planet Deneva in 2267, an intensively painful experience. He survived the Denevan neural parasites after being exposed to intense electromagnetic radiation that drove the parasites from his body. Spock was briefly feared to have been blinded by the light, but it was later learned that his Vulcan inner eyelid had protected his vision (TOS: "Operation - Annihilate!"). Spock was critically wounded on Tyree's planet in 2267 with an ancient weapon known as a flintlock. He survived, using a Vulcan healing technique in which the mind concentrates on the injured organs (TOS: "A Private Little War"). Following the conclusion of Kirk's five-year mission, Spock retired from Starfleet, returning to Vulcan to pursue the Kolinahr discipline. Although he completed the training, intended to purge all remaining emotion, Spock nonetheless failed to achieve kolinahr because his emotions were stirred by the V'Ger entity in 2271 ("Star Trek: The Motion Picture"). Spock subsequently remained with Starfleet and was eventually promoted to Enterprise captain when that ship was assigned as a training vessel at Starfleet Academy. Spock was killed in 2285 while saving the Enterprise from the detonation of the Genesis Device by Khan Noonien Singh. His body was consigned to space, but unknown to anyone at the time, his casket landed on the Genesis Planet ("Star Trek II: The Wrath of Khan"). Although believed dead at the time, Spock had, just prior to his death, mind-melded with McCoy. Spock had apparently intended for his friend to return Spock's katra to Vulcan in accordance with Vulcan custom. The presence of Spock's living spirit in McCoy's mind was later found to be an extraordinary opportunity to re-unite Spock's body and spirit when his body was found to have been regenerated on the Genesis Planet. The fal-tor-pan process was conducted at Mount Seleya on Vulcan, supervised by high priestess T'Lar ("Star Trek III: The Search for Spock"). Later, Spock underwent several months of re-education, during which his mind was instructed in the Vulcan way, but his mother, Amanda was concerned that he regain knowledge of his Vulcan heritage as well. Spock elected to return to Earth with his shipmates from the Enterprise to face charges stemming from Kirk's violation of Starfleet regulations in Spock's rescue ("Star Trek IV: The Voyage Home"). In later years, Spock's work became more diplomatic than scientific, even while he was still part of Starfleet. At the request of Ambassador Sarek, Spock served as Federation special envoy to the Klingon government in 2293, paving the way for the Khitomer peace accords with Chancellor Azetbur ("Star Trek VI: The Undiscovered Country"). 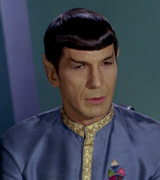 In 2368, Spock secretly traveled to Romulus, on a personal mission to further the cause of Romulan-Vulcan re-unification. Spock's disappearance caused great consternation among Federation authorities, and the Enterprise-D was dispatched to determine his whereabouts and intentions. Spock's contact on Romulus was Senator Pardek, who was believed to have met Spock during the Khitomer conference in 2293. Pardek was later learned to be an agent of the conservative Romulan government, seeking to use Spock's initiative to cover an attempted Romulan invasion of Vulcan. 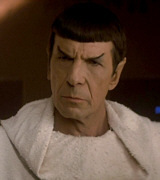 Following the attempted invasion, Spock chose to remain underground on Romulus in hopes of furthering the cause of re-unification (TNG: "Unification, Parts I and II"). Spock continued his activities in the Romulan underground, and in 2369 helped arrange the defection of Romulan Vice-Proconsul M'Ret to the Federation. Spock indicated he believed the escape of M'Ret would help establish an escape route for other Romulan dissidents who lived in fear of their lives (TNG: "Face of the Enemy"). Following the death of his father, Spock had one final, unexpected encounter with Sarek. Prior to his death, Sarek had mind-melded with Jean-Luc Picard, sharing with Picard his deepest emotions, unclouded by Vulcan logic. On Romulus, Picard allowed Spock to mind-meld with him, and Spock finally came to know of his father's love for him (TNG: "Unification, Part II"). * Picard states in TNG: "Sarek" that he attended the marriage of Sarek's son. But considering the long lifespan of Vulcans Sarek may well have fathered another son with his wife Perrin. ** Spock said that he worked with Pike for 11 years, 4 months, which suggests he was young enough when he first came aboard the Enterprise that he was probably still attending Starfleet Academy. Because of this, we may speculate that Spock's first year on the Enterprise was as a cadet. Chief Medical Officer aboard the Starship Enterprise NCC-1701 under the command of Captain James Kirk, who gave him the nickname "Bones" (TOS: "The Corbomite Maneuver"). As of 2267, McCoy had earned the Legion of Honor, and had been decorated by Starfleet surgeons (TOS: "Court Martial"). McCoy attended the University of Mississippi on Earth. While a student there. he met and had a romance with Emony Dax while she was visiting Earth around 2245 to judge a gymnastics competition (DS9: "Trials and Tribble-ations"). Early in McCoy's medical career, his father was struck with a terrible, fatal illness. Faced with the prospect of his father suffering a terrible, lingering death, McCoy mercifully "pulled the plug" on him allowing him to die. To McCoy's considerable anguish, a cure for his father's disease was discovered shortly thereafter and McCoy carried the guilt for his father's needless death for many years ("Star Trek V: The Final Frontier"). Prior to his assignment to the Enterprise, McCoy had been romantically involved with the future Nancy Crater (TOS: "The Man Trap"). In 2253, McCoy developed a neurosurgical technique that was used in 2372 by the Voyager's Emergency Medical Hologram to repair the damaged cerebral cortex of Danara Pel (VOY: "Lifesigns"). McCoy first joined the Enterprise crew in 2266, and remained associated with that illustrious ship and its successor for some 27 years ("Star Trek VI: The Undiscovered Country"). 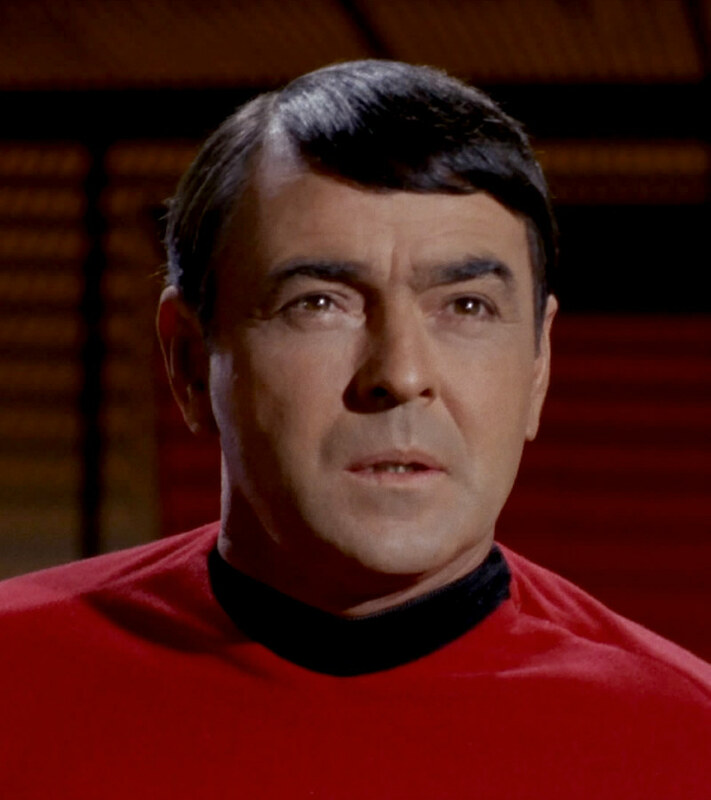 In 2266, McCoy was infected with the disease that caused the population of Mir's planet to perish, but he developed a cure (TOS: "Miri"). In 2267, McCoy suffered a serious overdose of cordrazine in a shipboard accident. In the paranoid delusions that followed, McCoy effected serious damage to the flow of time until Kirk and Spock followed him to restore the shape of history (TOS: "The City on the Edge of Forever"). Later in the same year, he found a cure for the rapid aging syndrome (TOS: "The Deadly Years"). 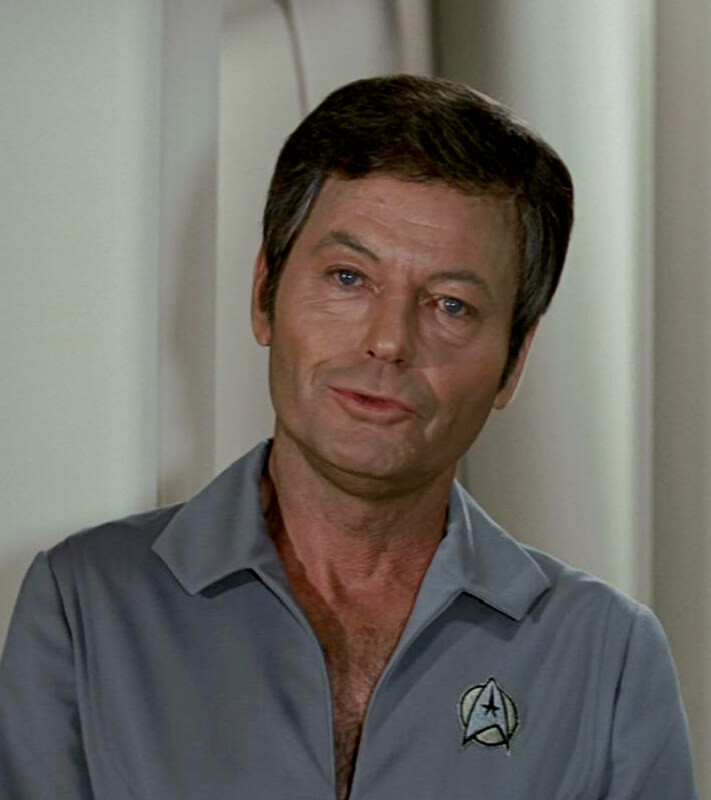 In 2268, McCoy was diagnosed with xenopolycythemia and chose to resign from Starfleet so that he could marry a woman named Natira, high priestess of the Yonadan people. McCoy rejoined Starfleet after a cure was found in the Yonadan memory banks (TOS: "For the World is Hollow and I Have Touched the Sky"). McCoy retired from Starfleet after the return of the Enterprise from the five-year mission, but he returned to Starfleet at Kirk's request when the ship intercepted V'Ger entity near Earth ("Star Trek: The Motion Picture"). McCoy, along with Kirk, was wrongly convicted of the murder of Klingon Chancellor Gorkon in 2293, a conviction that was later overturned. 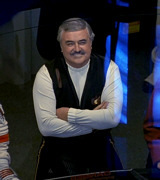 McCoy was scheduled to retire shortly after Khitomer peace conference, but he either changed his mind, or later returned to Starfleet ("Star Trek VI: The Undiscovered Country"). As a retired Starfleet admiral, McCoy made an inspection tour of the Enterprise-D in 2364 at the age of 137 (TNG: "Encounter at Farpoint, Part I"). 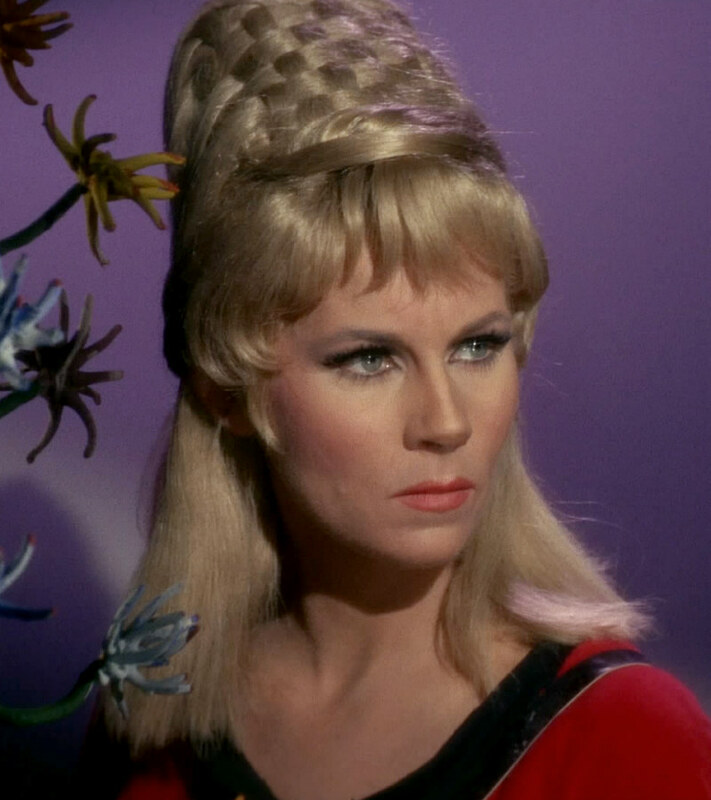 * A previous marriage was never mentioned or hinted at in TOS. In "The Way to Eden" McCoy's daughter Joanna was originally supposed to appear, but the character was changed to Irina Galliulin. DC Fontana, who penned the episode and was unhappy with the rewrites, also would have established that he was divorced. The idea would be picked up as late as in "Star Trek (2009)". Chief engineer aboard the Starship Enterprise NCC-1701 under the command of Captain James Kirk (TOS: "Where No Man Has Gone Before"). Scott's Starfleet serial number was SE 19754.T (TOS: "Wolf in the Fold"). Scott's engineering career began in 2243, and he served on a total of 11 ships (TNG: "Relics"), including a stint as an engineering advisor on the asteroid freight run from the planet Deneva, making the cargo run a couple of times (TOS: "Operation - Annihilate!"). The original USS Enterprise was the first starship on which Scott served as chief engineer (TNG: "Relics"), and he distinguished himself many times in that position by improvising engineering miracles that more than once saved the ship and its crew. In 2267, Scott was the main suspect in a series of murdered women on the planet Argelius II, until he was found to be innocent (TOS: "Wolf in the Fold"). While serving aboard the original Enterprise, Scott once suffered from a near-fatal accelerated again disease (TOS: "The Deadly Years"). He was actually killed in 2267 by space probe Nomad, although the errant probe later returned Scott to life (TOS: "The Changeling"). Scotty was scheduled to retire some three months after the Khitomer peace conference incident in 2293, and had bought a boat in anticipation of having more free time ("Star Trek VI: The Undiscovered Country"). Later that year, Scott was an honored guest at the launch of the Starship Enterprise-B. 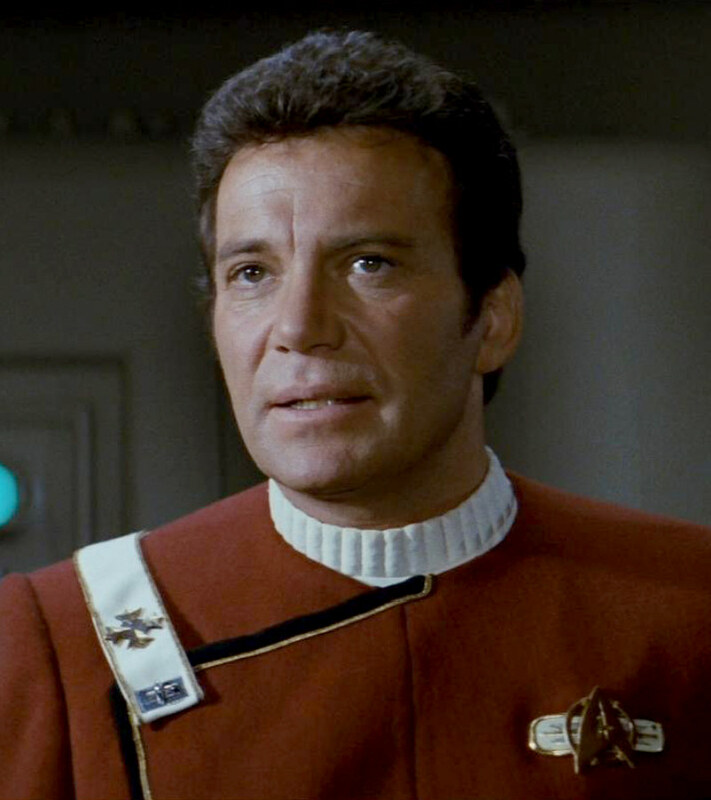 Captain James T. Kirk was lost and believed killed on that flight ("Star Trek Generations"). Scott finally did retire in 2294 at the age of 72, having served in Starfleet for 51 years. He was in the process of relocating to the retirement community at the Norpin Colony when his transport ship crashed into a Dyson Sphere. Scott, the only one who lived through the crash, survived for 75 years by suspending himself inside a transport beam. He was rescued in 2369 by an away team from the Enterprise-D*. Following his rescue, Scott embarked for parts unknown aboard a shuttlecraft "loaned" to him by Enterprise Captain Picard (TNG: "Relics"). Scott was not married, but he became romantically involved with fellow crew member Mira Romaine in 2269. That relationship ended when Romaine transferred to Memory Alpha (TOS: "The Lights of Zetar"). * We may ascribe to his initial confusion that Scott thought that Captain Kirk may have come to his rescue (who was believed dead at the time his ship crashed). Communications officer aboard the Starship Enterprise NCC-1701 under the command of Captain James Kirk (TOS: "The Corbomite Maneuver"). Born in 2239, her last name is derived from the Swahili word for freedom (TOS: "Is There in Truth No Beauty?"). 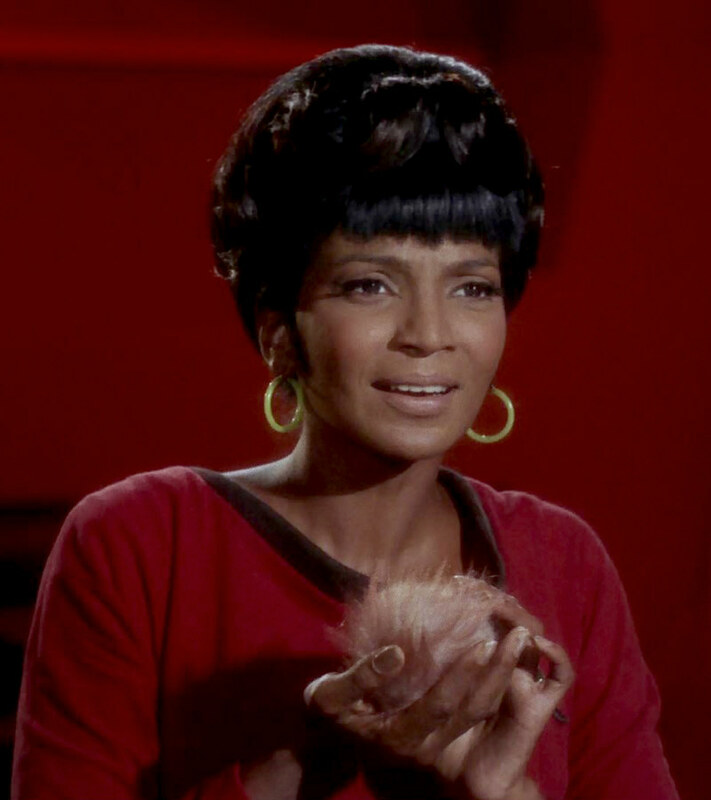 A highly skilled technician, Uhura was also a talented musician, and enjoyed serenading her fellow crew members with song (TOS: "Charlie X", "The Conscience of the King"). Her memory was wiped clean in 2267 by the errant space probe Nomad, requiring her to be re-educated (TOS: "The Changeling"). 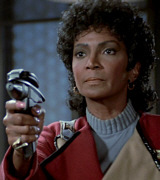 Following the reassignment of the original Enterprise to Starfleet Academy in 2284, Uhura served at Starfleet Command on Earth ("Star Trek III: The Search for Spock"). 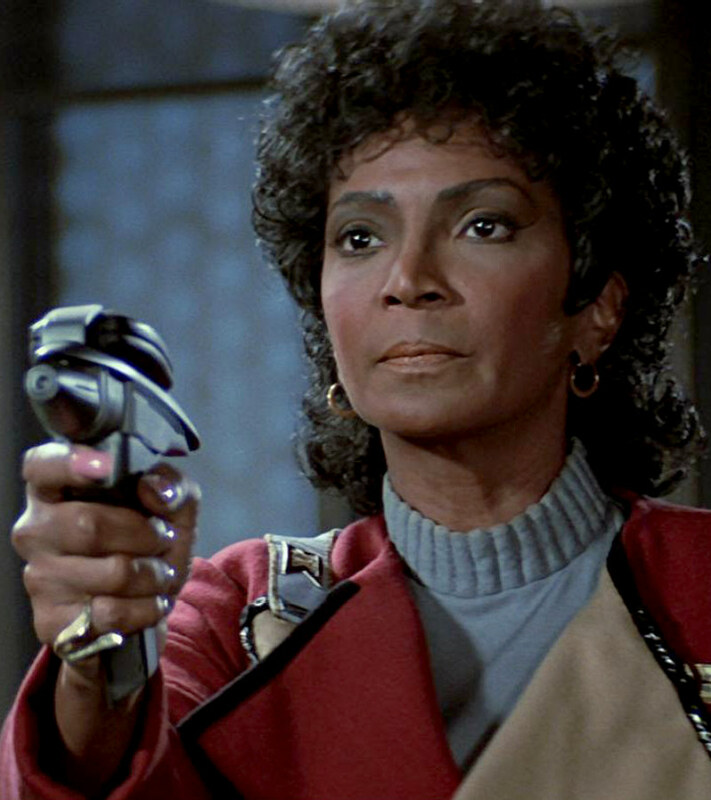 Uhura was scheduled to give a seminar at the Academy in 2293, although she volunteered to return to her old post on the Enterprise-A at Kirk's request prior to the historic Khitomer conference ("Star Trek VI: "The Undiscovered Country"). * Uhura's first name was never mentioned on screen prior to "Star Trek (2009)". The name Nyota (the Swahili word for star), which is consistent in fanon, was used behind the scenes. 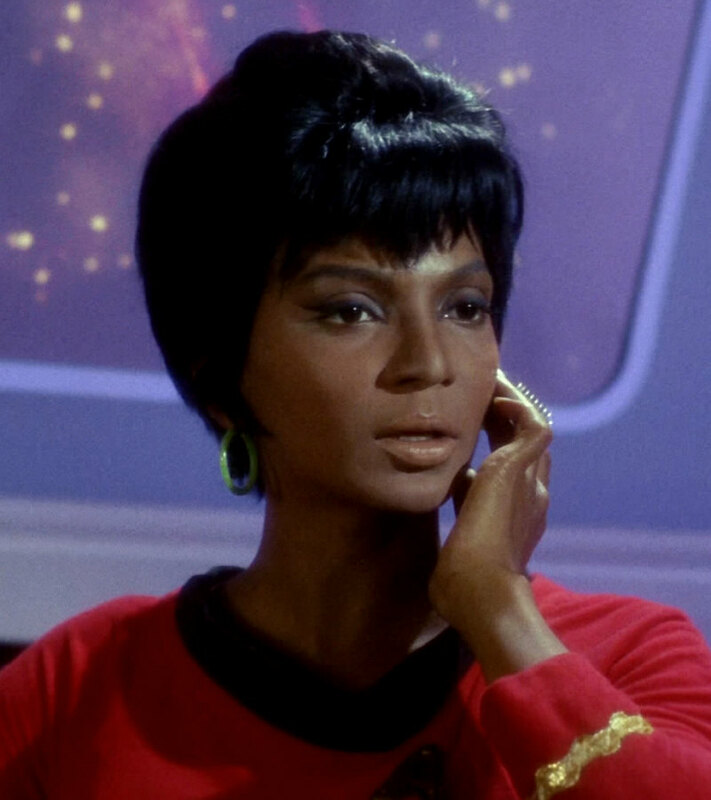 Strictly speaking, Uhura has no canon first name in the Prime Universe. Helm officer aboard the Starship Enterprise NCC-1701 under the command of Captain James Kirk. Hikaru Sulu, born in 2237 in San Francisco on Earth ("Star Trek IV: The Voyage Home") was initially assigned as a physicist (TOS: "Where No Man Has Gone Before") aboard the Enterprise in 2265, but later transferred to the helm (TOS: "The Corbomite Maneuver"). Sulu assumed command of the Starship Excelsior in 2290, and subsequently conducted a three-year scientific mission of cataloging gaseous planetary anomalies in the Beta Quadrant. Sulu and the Excelsior played a pivotal role in the historic Khitomer peace conference of 2293 by helping to protect the conference against Federation and Klingon forces seeking to disrupt the peace process ("Star Trek VI: The Undiscovered Country"). 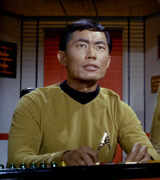 During the incident, Sulu demonstrated his loyalty and courage when he risked his ship and his career by violating Starfleet orders and attempting a rescue of former shipmates James T. Kirk and Leonard McCoy. During the attempted rescue, Sulu narrowly escaped a Klingon patrol commanded by Captain Kang in the Azure Nebula. Sulu never entered the incident into his official log (VOY: "Flashback"). 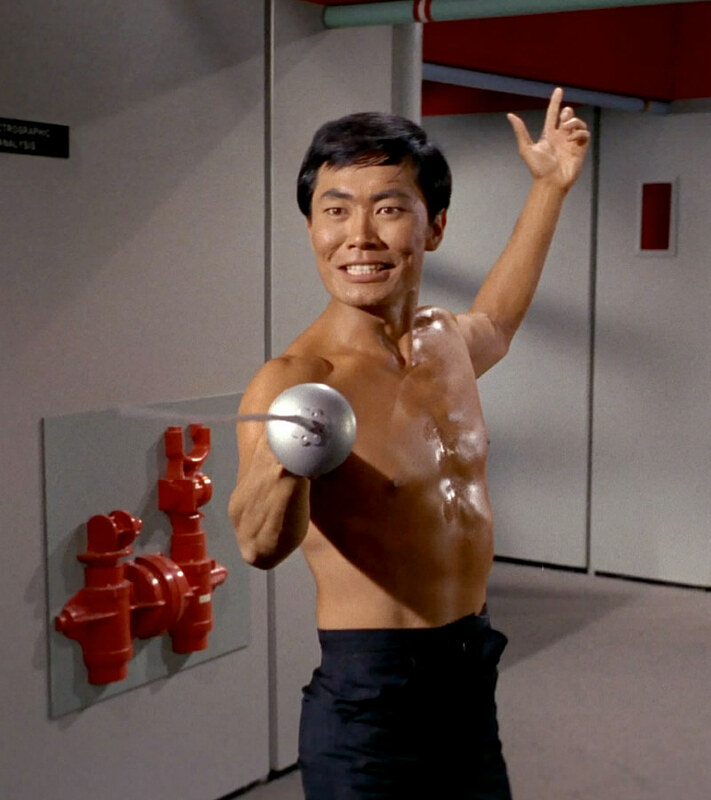 Sulu had a wide range of hobbies, including botany (TOS: "The Man Trap") and fencing. The latter interest surfaced when Sulu suffered the effects of the Psi 2000 virus in 2266, and Sulu threatened everyone in sight with a foil (TOS: "The Naked Time"). Old-style handguns were another of Sulu's hobbies, and he had always a Police Special in his collection (TOS: "Shore Leave"). 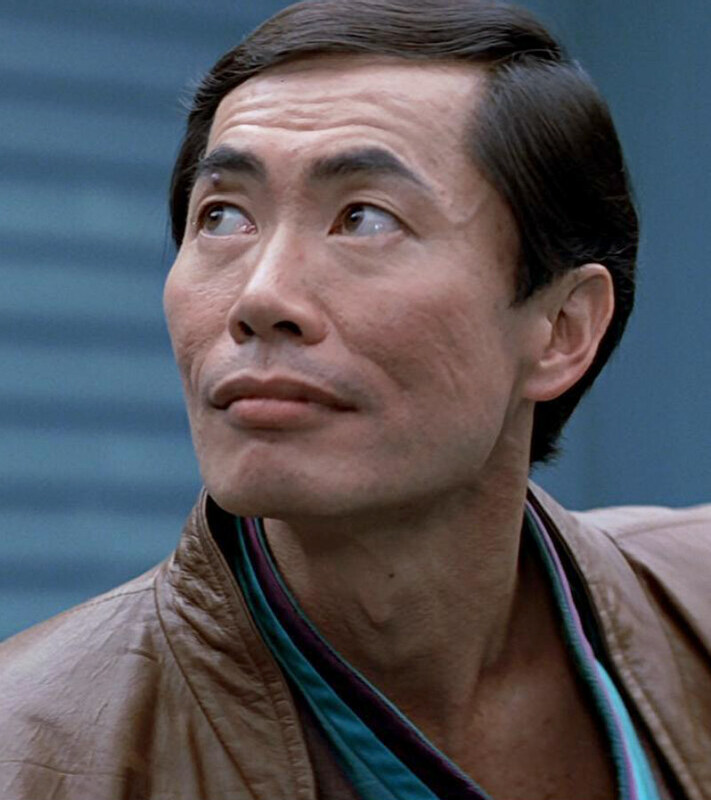 Hikaru Sulu had a daughter, Demora Sulu, born in 2271 ("Star Trek Generations"). * In VOY: "Tattoo" Chakotay states: "I asked Captain Sulu if he would sponsor me at Starfleet Academy." It is well possible that he refers to Hikaru Sulu, but it may be just as well an unmentioned son or someone unrelated. ** Sulu is supposed to be of Japanese descent, because George Takei is of Japanese descent and Hikaru is a Japanese name. Sulu, on the other hand, is not a Japanese name. In the Japanese dubbing this was apparently deemed too implausible, and the character was renamed "Mr. Kato". *** This refers to the Prime Sulu. The child in "Star Trek Beyond" is too old to be the Demora Sulu of "Star Trek Generations". Also, we don't know if Prime Sulu is gay or not, and we shouldn't care. Navigator on the Starship Enterprise NCC-1701 under the command of Captain James Kirk. Born in 2245* (TOS: "Who Mourns for Adonais? 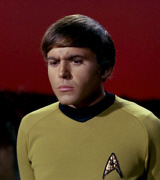 "), Chekov held the rank of ensign when he came to the ship (TOS: "Catspaw"). His Starfleet serial number was 656-5827B ("Star Trek IV: The Voyage Home"). Pavel Andreievich Chekov was an only child, although he once imagined he had a brother named Pyotr while under the influence of the Beta XII-A entity (TOS: "Day of the Dove"). While at Starfleet Academy, Chekov became involved with a young woman named Irina Galliulin, but the relationship did not last because Galliulin was uncomfortable with the structured way of life required by Starfleet. Years later, the two met again when Galliulin sought the mythical planet Eden with Dr. Sevrin (TOS: "The Way to Eden"). 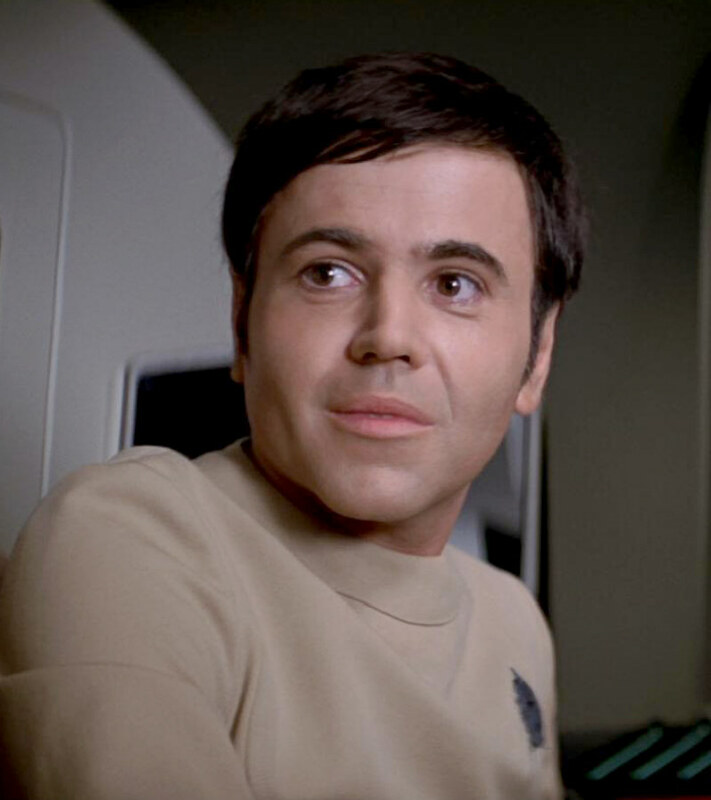 In 2267, Chekov was the only member of an Enterprise landing party to Gamma Hydra IV who was not affected with an aging disease. During the mission, Chekov became startled at the sight of a dead colonist. The surge of adrenaline protected him from radiation sickness that caused the aging process (TOS: "The Deadly Years"). Chekov was promoted to lieutenant and assigned as security chief aboard the Enterprise following the conclusion of Kirk's first five-year mission ("Star Trek: The Motion Picture"). Chekov later served aboard the USS Reliant as first officer under Captain Clark Terrell, before returning to the Enterprise after the Reliant was destroyed at the Mutara Nebula by Khan** ("Star Trek II: The Wrath of Khan"). Chekov was an honored guest during the maiden voyage of the USS Enterprise-B in 2294 ("Star Trek Generations"). * The alternate reality version of Chekov is four years older and would have to be a genetically different person ("Star Trek: 2009"). ** It is no big deal that Khan recognized Chekov in "Star Trek II". Chekov may have been on board already, and Khan may have seen him off-screen. Nurse aboard the Starship Enterprise NCC-1701 under Chief Medical Officer Leonard McCoy. Chapel gave up a promising career in bioresearch to sign aboard a starship in the hopes of finding her lost fiancé, Dr. Robert Korby. Chapel found Korby on the planet Exo III in 2266, but learned that he had transferred his consciousness into an android body. Korby was destroyed by another android on that planet (TOS: "What Are Little Girls Made Of?"). 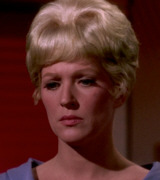 Chapel admitted she was in love with Mr. Spock while under the influence of the Psi 2000 virus, although Spock did his best to ignore this (TOS: "The Naked Time"). In 2268, Chapel was a temporary host to Spock's consciousness, which Sargon had placed in her mind. This way, Spock was saved when Henoch, who occupied Spock's body at the time, destroyed the receptacle for Spock's mind (TOS: "Return to Tomorrow"). Following the return of the Enterprise to Earth in 2270, Chapel earned a medical degree and later returned to the Enterprise as a staff physician ("Star Trek: The Motion Picture"). Chapel directed emergency operations at Starfleet Command when Earth was threatened in 2286 with ecological disaster by an alien space probe of unknown origin ("Star Trek IV: The Voyage Home"). Starfleet officer who served as Captain Kirk's yeoman during the early days of Kirk's first five-year mission aboard the Starship Enterprise NCC-1701 (TOS: "The Corbomite Maneuver"). In 2266, young Charlie felt attracted to her, but she tried to explain to him that he should watch out for a younger girl (TOS: "Charlie X"). Rand returned to serve aboard the Enterprise as transporter chief in 2271 ("Star Trek: The Motion Picture"). 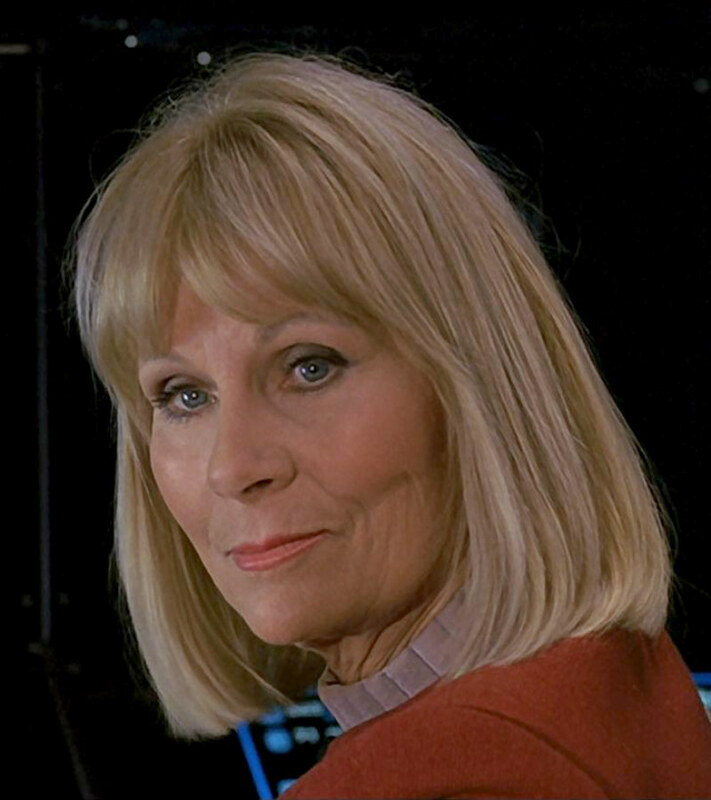 She subsequently served at Starfleet Command in San Francisco, where she assisted in directing emergency operations when Earth was threatened with ecological disaster by an alien space probe ("Star Trek IV: The Voyage Home"). 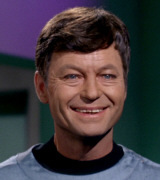 Rand later served as communications officer aboard the USS Excelsior under the command of Captain Sulu ("Star Trek VI: The Undiscovered Country"). She was team leader of that ship's gamma shift (VOY: "Flashback"). * Rand was a lieutenant junior grade in "Star Trek VI", but in VOY: "Flashback", set at the very same time (2293), we could see her as a lieutenant commander. Since her more definite involvement in the latter story implies that she was a higher ranking officer while Tuvok was just an ensign, she is listed here as a lieutenant commander. Grace Lee Whitney also appeared in "Star Trek III" in the spacedock lounge, here as a commander. For the sake of continuity we may assume this wasn't Janice Rand, even if it was the original intention (or it may have been Rand, only with a lower rank).